I will write more about the inspirations for this story when it goes live. It is scheduled to appear in the 8th Anniversary Double Issue of BCS in late September. As always, I am grateful to editor Scott H. Andrews for his work and support of my Birdverse stories, and to my readers Bogi Takács, Shweta Narayan, Jenn Smith, and Corey Alexander for their helpful comments. I’m looking forward to sharing this story with you! My Birdverse poem “Mirrored Mappings” is up at Through the Gate today! Thanks to the editor Mitchell Hart for this, and to my stalwart supporters on Patreon!! 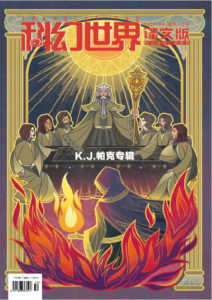 I signed the contract and am very happy to announce that my Nebula-nominated Birdverse novelette “Grandmother-nai-Leylit’s Cloth of Winds” will appear in Chinese translation in Science Fiction World. Here is the website with some recent issues, and here is an English-language Wikipedia page about the magazine. I am very excited about this translation, and glad that Birdverse will find new readers. I also love their cover art! 1. Nalo Hopkinson has just created the Lemonade Award to “to recognize five people and groups who in the previous year have done something that makes positive change in science fiction community.” Check out the Strange Horizons article for more information on how to help. Strange Horizons has also recently hosted a Nalo Hopkinson special with short story story, podcast, and roundtable. Nalo has co-edited People of Color Destroy Science Fiction. 2. 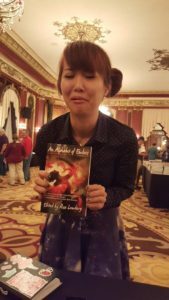 Alyssa Wong (@crashwong) won the Nebula award this year with her story “Hungry Daughters of Starving Mothers” in Queers Destroy Horror special issue of Nightmare Magazine. Alyssa has a new story in Uncanny Magazine, “You’ll Surely Drown Here if you Stay.” Check out this page for information on how to support Alyssa’s work. 3. Na’amen Gobert Tilahun (@naamenism) has a new novel out: The Root, the first in his The Wrath & Athenaeum trilogy. The Root just came out from Night Shade Books. Na’amen has a column at John Scalzi’s The Big Idea, talking about identity, race, inclusion, and the new novel. 4. Lisa M. Bradley (@cafenowhere) is a poet and writer whose debut collection, The Haunted Girl, is available from Aqueduct Press. For a quick taste of Lisa’s work, check out “Aboard the Transport Tesoro“, a poem in Uncanny Magazine. Lisa has written many wonderful longer poems, including “Una Canción de Keys” in Strange Horizons and we come together we fall apart, in Stone Telling and in Here, We Cross, a collection of queer and genderfluid poetry from Stone Telling (disclaimer: I edited the collection). 5. S. Qiouyi Lu (@sqiouyilu) has two wonderful recent poems in inkscrawl: Consistencies and Particularities. A recent translation by S. Qiouyi Lu and Ken Liu (“Chimera”, by Gu Shi) is available at Clarkesworld. They also have a great Ace Author Spotlight on The Pack of Aces. You can find out how to support S. Qiouyi Lu on this page (yes, they have a Patreon!). 6. Amal El-Mohtar (@tithenai) – is a Nebula nominee this year with “Madeleine,” included in Queers Destroy SF special issue from Lightspeed. In this issue you can also read a series of brilliant essays by the LGBTQIA members of the speculative fiction community; many of the essays are by writers of color. For more Amal’s work, check out her collection The Honey Month, with stories and poems about different flavors of honey. Amal will be the Guest of Honor at the next Wiscon. 7. 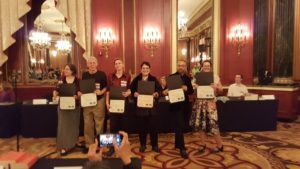 Henry Lien (@henrylienauthor)’s composition, choreography, and performance of “Radio SFWA” was a highlight of 2016 Nebula Awards. You can listen to the song on Youtube, and read about it on Henry’s website. I loved his story “Bilingual” in March 2015 issue of Fantasy and Science Fiction. 8. For a taste of Carmen Maria Machado‘s (@carmenmmachado) gorgeous short fiction, try the Nebula and Shirley Jackson Award nominated “The Husband Stitch,” “Descent” in Nightmare Magazine, and “Help me Follow my Sister into the Land of the Dead,” in Lightspeed. Carmen Maria Machado’s debut fiction collection, Her Body and Other Parties, is forthcoming from Graywolf Press next year. 9. Craig Laurance Gidney (@ethereallad) has a short fiction collection Skin Deep Magic (Rebel Satori Press; Amazon), which seems to have flown under the radar for a lot of people. It is really cool and worth your attention! 10. M. Sereno (@likhain) is a wonderful artist and poet. Her portfolio is available at Artstation. For a taste of Mia’s written work, check out these poems: Brown woman at Safety Beach, Victoria, in June (Uncanny Magazine); Seeds (Strange Horizons); Adarna (Strange Horizons); The Exile, i (Stone Telling). Mia has a Patreon, where she shares work in progress. A few years ago in Kansas City, I visited the Mission Road Antique Mall. I love going to places that have old beautiful old objects, because I love art and material culture. My parents have done a lot of interior design work, and I grew up around it. Looking at old and intricate things is soothing to me, even though I cannot afford to buy them. That day in Kansas City I was adrift. I had recently divorced. I’d sold a lot of odds and ends on Craigslist while emptying the house, and had a bit of cash. It was serendipity – there is always serendipity. Drucilla Gault had died, and I guess they were clearing out her estate. She lived in Kansas City. I like to imagine she had a quiet life. I think she went to church. And she painted. I do not know any people who have heard about Drucilla Gault. The Internet is not helpful. Many women artists have not been documented, were never in a spotlight no matter how good their work was. 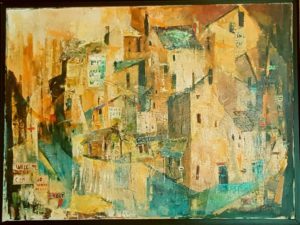 But as I walked around Mission Road Antique Mall, I saw this painting on a wall – a large cityscape, in the genre of mid-century cityscapes. Signed. Dated. Untitled. 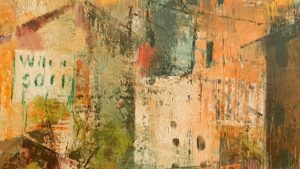 Done with the smallest brush, the oil painting shone with intricate layers of golden light with a green underlayer, illuminating the masses of buildings, the elaborate, fading street sighs, the muted shadows. The painting’s city-world, translucent and incredibly detailed, floated and beckoned. And because women artists are undervalued, and vintage paintings by relative unknowns are undervalued, the price tag was much lower than it should have been. And because of serendipity of divorce and Craigslist, on that day, I could take it home. And so I did. When I look at this painting, I see a work of quiet genius that took time and vision and patience to create – a work as intricate and luminous as the best old embroidery. It is a quiet piece which is complex and which invites a closer look. I do not know why Drucilla Gault was not better known. I have no idea what else she painted, whether this was her masterpiece, whether there are many other paintings, undocumented but hopefully as admired. When I think about what I want my writing to be, it is this. The tiniest brush. Layers and layers of light. I just heard from my editor that the World Fantasy Award nominations are open, with a very narrow voting window: they are due on June 15, 2016. WFA is mostly a juried award, but 2 slots in each category are open for voters. Members of the 2014, 2015, and 2016 World Fantasy conventions are eligible to vote. 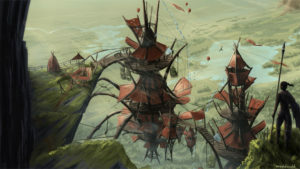 Scott Andrews has a detailed entry at Beneath Ceaseless Skies. My Birdverse novelette “Grandmother-nai-Leylit’s Cloth of Winds” is eligible in the NOVELLA category. I am back from the Nebula Awards weekend, which I attended with my wonderful spouse, Bogi Takács. It made all the difference to be there with Bogi rather than on my lonesome. The con was excellent. I met many wonderful people face-to-face for the first time, participated in two panels (“Language as Rebellion” and “Historical Research from the Margins”), and attended a few more panels, learned things – it was great. The hotel was often overwhelming, but allergy-friendly foods were available in the con suite, which we really appreciated. At the Award ceremony, Henry Lien and friends’s Emperor Stardust and the Eunuchs of the Forbidden City performing “Radio SFWA” was one of the highlights of my eventful life. I hear a video will be available soon. I did not win, but I participated in the Alt! Awards ceremony (also the brain child of the inimitable Henry Lien). The Alt! Awards was easily my favorite part of the evening. I read a very dark unpublished Birdverse poem (“Laukur at the Court of Ladder”), which I think a few people liked. I am really happy with Alyssa Wong’s win in particular. You can read more on Alyssa’s blog, and watch the acceptance video. I am also so pleased that C.J.Cherryh received the Grandmaster award. I have been her fan since college, and I very rarely fanperson anything. I no longer fanperson her to the same degree I did in college, but I think she absolutely deserved the honor. Plus, I learned that she and her partner got married!! Thrilled with this development. We did not manage to launch An Alphabet of Embers at this con due to printer snafus, but we are very close to launch once printer snafus are vanquished. I have been honored and moved to read Sessily Watt’s latest (and last) Facing the Raven’s Eye column at Bookslut, titled In Hope, which focuses on my Birdverse work. But when literature includes moments of empathy — of growing the world, fictional or otherwise — it offers hope in the midst of pain. In this sense, Rose Lemberg is among the most hopeful authors currently writing. In the Birdverse, a magic loosely based in geometry is a source of craftsmanship, art, protection, and healing. Multiple cultures and countries engage in trade relationships and political alliances. Cultures make use of magic according to their own traditions and rules, and worship the deity Bird, in whichever feathered form Bird takes. And within these countries and cultures, individuals hurt and are hurt, heal and are healed. One of the often-used tools in the Birdverse box of empathy is the perspective of a trader, who shifts between their own culture and the culture of another, trading not only physical objects but traditions and ideas, too. The intricate geometry of the magic system — its arrangements of polysyllabic “deepnames” — seems to be mirrored in the relationships of the characters… Both the characters’ relationships and the magic system emphasize coexistence and support, often involving a mix of what is considered strong and what is considered weak. And every story holds a deep and painful honesty about the harm we cause each other through fear, the “vessels of brokenness” we become under our own actions and the actions of others, and the warmth and wholeness that can be found through acceptance of one another. Sessily also offers an in-depth look at two stories, “The Desert Glassmaker and the Jeweler of Berevyar,” and “Geometries of Belonging.” The whole column is here. Check out the other Into the Raven’s Eye columns by Sessily Watt here. I am really, really moved by this. Thank you.